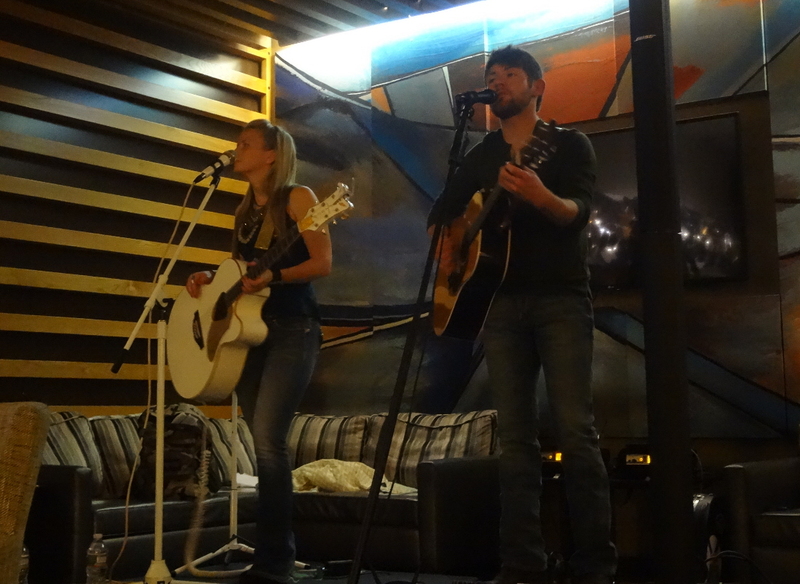 Jilly Martin and Ryan Brooks Kelly are a local country duo with a good pedigree as is apparent from the list of big names they’ve shared the stage with. Also, more importantly to those of us who care about such things, they’re outstanding musicians and performers. When sampling their music in advance of this evening, the song that convinced me they were a must-see was their catchy, fun original “Young, Broke, and Beautiful.” Both have strong country voices – Jilly’s is a sweet, high voice well-suited to classic country, while Ryan’s is a modern country voice with a bit of an edge, with the added ability of throwing in a good twang when called for. Together, their voices blend exceptionally well, so it’s a real treat to hear them sing harmonies, and they find a way to work to their own vocal strengths in their originals. The performance space at Chopps is in the bar area of the restaurant, adjacent to the lobby of the Marriott Hotel in which it’s located. As a result, the musical performances tend to be a little subdued. 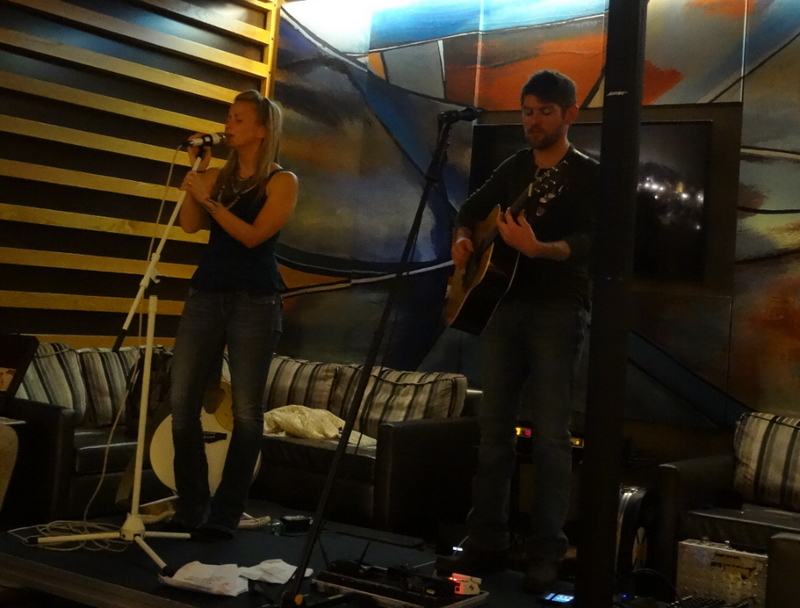 On this particular night, Martin and Kelly delivered a performance well-suited to a toned-down environment like Chopps, with patrons enjoying their music both actively and passively. I stayed for the first half of their 3-hour time slot and thoroughly enjoyed myself; I always love the food, service, and setting at this restaurant, so when there’s good live music here, I’m an “easy sell.” I do, however, look forward to catching Martin and Kelly in a livelier environment one of these days to see more of their energetic side. There were other noteworthy covers I caught during the evening’s performance. For example, there was a rendition of “Make You Feel My Love” that was sung sweetly by Jilly, somewhat like a lullaby. Thomas Rhett & Tori Kelly’s “Die a Happy Man” offered them an opportunity to showcase their sweet harmonies in a nicely blended duet. 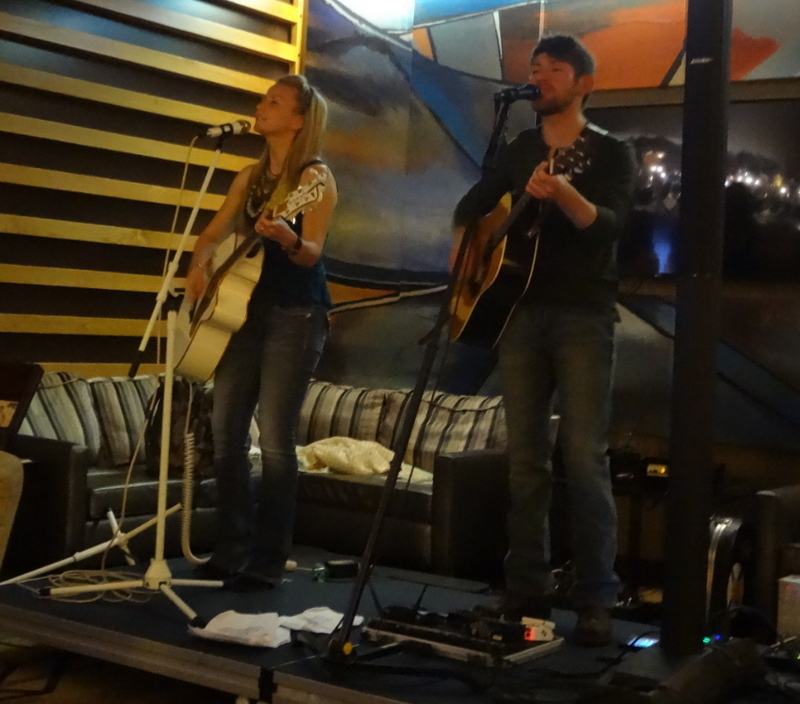 And Willie Nelson’s “Always On My Mind” afforded Ryan a chance to put his sweet crooning skills on display, while Jilly picked up the second verse strong, and the song lent itself to some classic harmonies, too; certainly, this is one of the duo’s strongest covers. Also notable was Martin and Kelly’s rendition of Joey + Rory’s “Cheater, Cheater.” Jilly channeled Johnny Cash, it seemed, for some of the low notes on this picker and grinner, while Ryan’s guitar did its best banjo impression. And the duo delivered a fun country version of Avicii’s “Wake Me Up,” with Jilly and Ryan taking on Aloe Blacc’s vocal line by swapping the vocals back and forth, adding an interesting texture to the song. 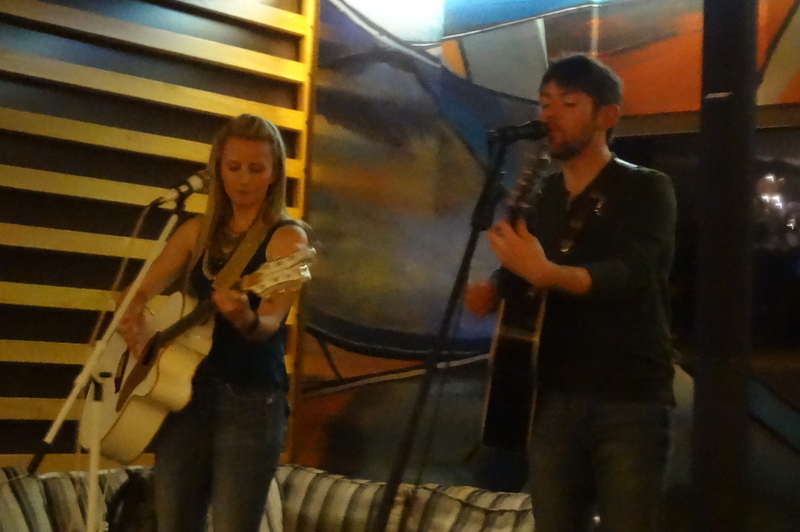 But, again, this duo shines the brightest during Martin and Kelly originals. The original they performed during their first set was “I’m Gonna Kiss You,” on which both singers seemed to play to their strengths. And, of course, just as the clock hit my personally previously-determined exit time, three songs into their second set, the duo cranked up “Young, Broke, and Beautiful.” So I stayed for one extra song. Simply wow. It’s an energetically fun original with well-crafted vocal harmonies, Jilly and Ryan’s individual vocal parts each residing within their own personal sweet spots and blending perfectly together, augmented by a nice supporting guitar line and subtle hooks. This one’s radio-ready and hit-caliber. And a great time for me to call it a night, to end on a high note, at the conclusion of my own personal favorite Martin and Kelly original… though I’m sure I’d’ve enjoyed the remaining 90 minutes of the band’s program if I hadn’t wanted to get home. Martin and Kelly’s upcoming concert schedule has them crisscrossing New England, with many shows in Massachusetts, Connecticut, and New Hampshire. plus the odd Rhode Island gig and a few shows in Verona, NY. Check the “Shows” page on their website for upcoming dates on a schedule that’s already packed until the fall and starting to fill in beyond, as well. 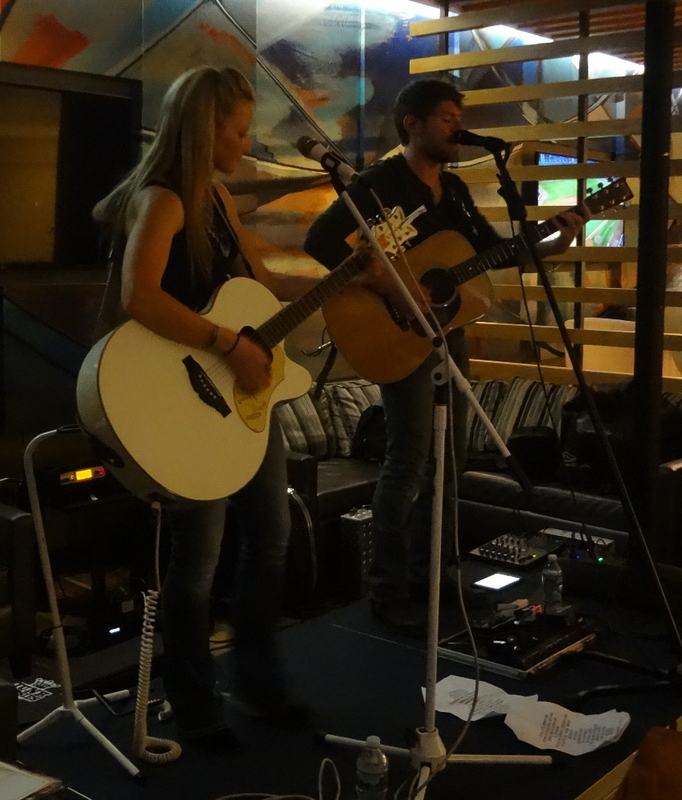 According to Martin and Kelly’s website, their next few shows are… tonight, May 24th, at Sylvan Street Grille in Salisbury, MA with 101.7 The Bull; Friday, May 26th at World of Beer in West Hartford, CT; Saturday, May 27th at the Tin Rooster at the Turningstone Casino in Verona, NY; Tuesday, May 30th at a WOKQ event in Seabrook, NH; Thursday, June 1st at the Boston Harbor Hotel in Boston, MA; Friday, June 2nd at Station Eight in Marshfield, MA; and Saturday, June 3rd at the Whiskey Barrel in Haverhill, MA. This entry was posted in Live Reviews and tagged Geoff Wilbur, Geoff's Night Out, Jilly Martin, Live Review, Martin and Kelly, Ryan Brooks Kelly. Bookmark the permalink.